Still cute, but issues have arisen over decreased quality. These cuddly creatures change their mood faster than a cat getting a belly rub. Full of stuffing, love, and rage, Feisty Pets release their inner demon with a simple squeeze of the head. The doe-eyed gaze of affection instantly changes into a sharp toothed snarl. How perfectly lovable. Most customers have been very excited about the toy. It pleases just about everyone, needs no batteries, and is just as gift-worthy for 4 year olds as it is for adults. The head is easy to squeeze and needs only a small amount of force, so even young children should be able to activate the face change. We have noticed a dip in quality since around mid-December 2016, so buyers should inspect for busted seams, loose stitching, and faces that get stuck in the angry position. We were also made aware of problems with a popular UK distributor, which we address below. This measure how often, for how long, and how many different ages will play with this toy. A great toy will be loved for years, and is still wanted as the child grows. This measures the quality of the materials and production processes used. This scores how well a toy encourages critical thinking, pattern recognition, and memory improvement. Including both gross and fine motor skills, this measure how much this toy engages and challenges physical mobility, body awareness, and coordination. This measures how likely a toy is to spark social play between children or how well it teaches socially healthy behavior. Each toy stands about 8 inches tall. Internal parts are covered in fabric and some stuffing, but due to the inner workings, the toy is not a true "stuffed animal." Unlike traditional mechanical plush toys, the bulk of the hard pieces are located in this toy's head instead of the belly. Gently squeeze the back of the head to instantly change the facial expression from friend to beast. The premise of the toy is simple. Squeeze the back of the head to trigger an abrupt change in the facial expression. A grin turns to a grimace in a flash, then goes back to the original expression once the head is released. The body is like any other stuffed animal, with the mechanism for the expression change located in the head. Most kids seem to be okay cuddling with the toy, though the hard plastic parts on the face may not make it the best bedtime buddy. We’re serious about being wary of dogs. Once dogs see the face change, they’re going to respond to the sharp teeth, which is a clear signal that the dog is being threatened. Most dogs will tuck tail and slink away, unsure as to why their beloved family would bring a tiny death goblin into their home, but a few may not react so passively. Just be nice, and don’t terrorize the dog. Dogs are good people. As mentioned above, since December 2016, complaints have appeared regarding a noticeable drop in toy quality. Some toys will fail to change expression, getting stuck in the angry position, and may require manual pressing of the eyebrows and mouth to reset the toy. Some users have received toys with seams already splitting open, with other seams unraveling within the first week. A few buyers have complained of parts falling off the toy, particularly the eyebrows. While we are not concerned with any choking hazard, as this toy is not meant for toddlers, we are disappointed in the lack of quality control. Most of the toys arrive working fine and with no visible problems, though we highly recommend inspecting the toy for damage upon arrival, to ensure the timeframe for returns is not passed. We were also made aware of some shady business for our friends across the pond. 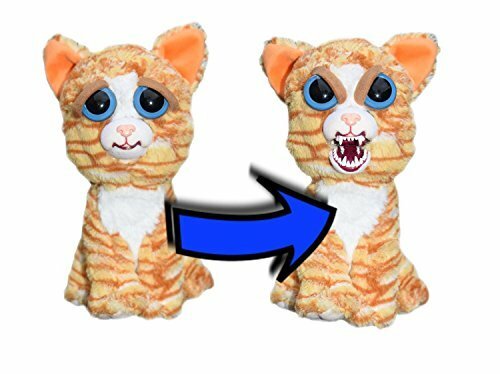 Feisty Pets UK, one of the first authorized UK distributors for the toy, has apparently been accepting orders without the merchandise to fill them. Angry customers have been reporting to a Facebook group, Feisty Pets UK We Want the Truth, in the hopes of finding a way to make the company hear them. Many of the page members have not received their order after months of waiting, and their communications with the distributor have been ignored. We contacted the manufacturer, William Mark Corporation (WMC) for clarification on the issue, and have not heard back. If you purchased a toy through Feisty Pets UK, have not received your order, and are being ignored, please contact whatever service you used to complete the transaction. That could be your bank, credit card company, or PayPal. For those still wanting to purchase a Feisty Pet, particularly those in the UK, we highly recommend either going through Amazon, or finding the toy in-store. To see other toy cleaning methods, check out our Cleaning Guide to Toys. There are a number of Feisty Pets to choose from, so it should be easy to please just about anyone. We’re worried about how the construction quality has decreased since December. If your rubber duckie is looking a little green (with mold, not envy), we've got a few ways you might be able to save it. Some adventures involve imaginary castles and dragons. Others involve mud puddles. However it happens, be it spill or splash, we tell you how to clean stuffed animals and other plush toys. We describe what our scores mean, and how we get them. Welcome to The Guide for Toys! We provide unbiased reviews and ratings of children's toys. © 2016 The Guide for Toys - all rights reserved. Tell us what you think of the new site? Is there a toy you didn't see on our site that you would like reviewed? Do you have any suggestions for our website? Let us know!